The boy was probably 5- or 6-years-old, maybe younger. He wore a red No. 1 jersey and yelled “Go Big Red” as he tossed a smallish, not-quite-Day-Glo orange football in the grass a block or so south of Memorial Stadium along 10th Street, presumably while his parents tailgated nearby. Though Nebraska had lost to Colorado barely an hour earlier, the boy was excited. His youthful exuberance should’ve reflected the attitude of Husker fans in the wake of the first game of the Scott Frost era, despite the final score. The injury to Adrian Martinez notwithstanding, the post-game theme should have been one of optimism. No need to dignify it specifically here, but there was already unrest on social media. Scratch “tie” and you would have what some apparently felt about Frost. The reputation is deserved. But like those of other programs, some Husker fans are unreasonably impatient, remaining so despite the enthusiasm that attended the arrival of Frost and staff. Nebraska’s Hall of Fame coaches, Devaney and Tom Osborne, both felt the impatience. They certainly didn’t have smooth rides to national championships, as it might seem in retrospect. Following 6-4 seasons in 1967 and 1968, a petition calling for the firing of Devaney was circulated in Omaha after Devaney refused to fire any assistants. Two seasons later, his Huskers won the school’s first national championship and followed with a second the next season. Following the 1976 Astro-Bluebonnet Bowl victory against North Carolina, a regent told Osborne it was a good thing his fourth team had won the game, the implication being his job might have been in jeopardy had the Huskers lost. Osborne’s record to that point was 37-10-2. But he was 0-4 against Oklahoma and 1-3 against Missouri. In 1978, Osborne seriously considered becoming the coach at Colorado because of fan disaffection over his teams’ inability to beat Oklahoma. And in the late ‘80s and early ‘90s, Osborne’s run-oriented offense drew criticism because of a bowl-game losing streak that reached seven – before his 1994 team defeated Miami in the Orange Bowl for the first of three national championships in his final four seasons. His 1993 team barely missed a national championship. Nebraska’s record in his final five seasons was 60-3. Before that closing run, Osborne often told reporters he was only one seven-win season away from being fired. Devaney, the athletic director, wouldn’t have, but some fans might’ve demanded it. Patience is a virtue, no great insight there. The lack of it, well . . .
Also, consider something else Osborne regularly said: A team makes its greatest improvement from the first to the second game. Again, no great insight, just common sense. “I’ve never make an excuse, but having a game last week certainly, probably would’ve helped the way we came out and played,” Frost said during his post-game news conference. 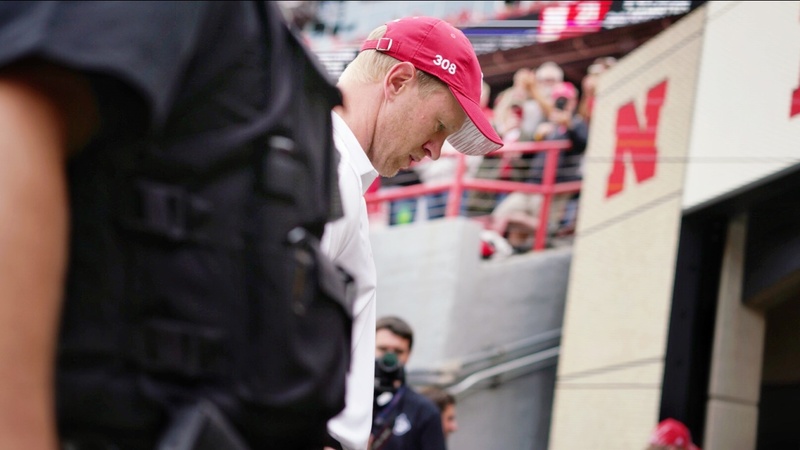 He wished the first-game mistakes could have been made the week before, Frost said, acknowledging a lesson reinforced, if not learned, while playing for Osborne. No disrespect toward Akron intended, but had Nebraska played the Zips a week ago, Saturday’s outcome might well have been different. It would have been in my opinion. Anyway, Husker fans should have come away disappointed by the loss but encouraged by the future, with the enthusiasm of the youngster in the No. 1 jersey. Farther down 10th Street, the music of Journey played in a beer garden, the song “Don’t Stop Believin’.” An appropriate message just one game into the Frost era.